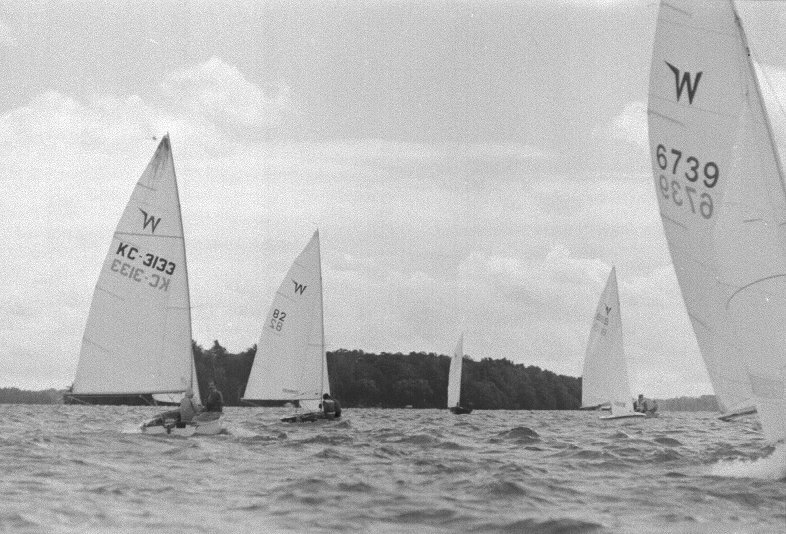 This was the Monday afternoon race and above, you can see Fred Webster (3133), Nick White (82), ?? ?, Julian Redman (8189) relaxing as lunch ends. Bill Fyfe (6739) is getting the first of the ever stronger puffs. They're off with Graeme Hinton in 7900 enjoying a very nice leeward end start. Not so Uncle Al. Right at the start, he got into a barging position, thought he'd found a gap behind Ian Porter only to have it quickly filled leaving Al with the choice of planing into W5208 broadside or luffing up and pronging Ian Porter's transom at slightly lesser velocity. My apologies and thanks to Ian who wouldn't even let me pay for the damage. From there, after our 720, I decided we might as well bang a corner, so we headed west into the NW wind. Needless to say, it paid handsomely to go right as it turned out. 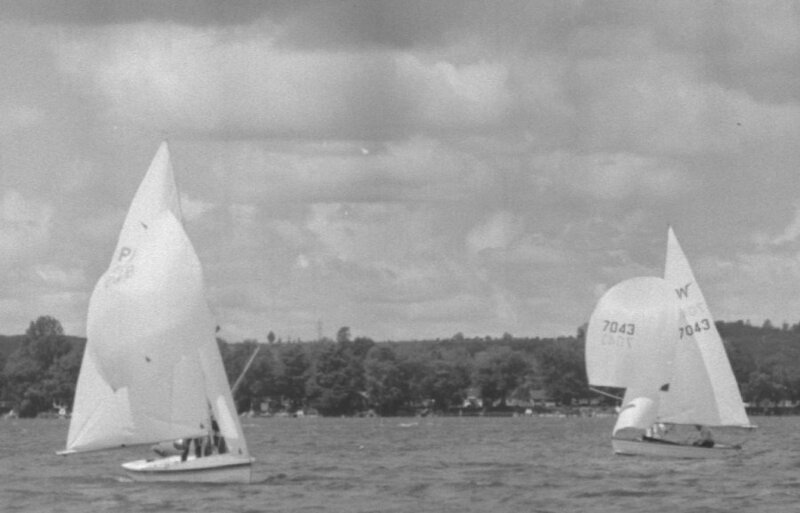 That could be Uncle Al doing his 720 (5th from the right) as the fleet already shows signs of sorting itself out. Off to the "wrong" side of the first beat are Graeme (7900), Rick Appel (2488) and Robin Barker (4286). Note how beautifully flat the Brits (7900 & 4286) keep their boats! ... goes on! Note how Geoff (198, 2nd from left) is feathering his main in a major puff to keep Nipegegi on her feet. Both Earl Schnur (1028) and Fred Webster (3133) should be preparing for this nasty puff. Fred also needs more vang to flatten his main/bend the mast and generally depower. Still the "wrong side" of the first beat! Those who went left along the Geneva Park shore did much better! Tony Perkins and Geoff Hodshon. After getting trashed by Al at the start, Ian Porter (7588) is beginning to recover some lost ground. But at the gybe mark, it's still Julian over Tony.